Determining whether or not you are a good candidate for cosmetic plastic surgery, such as an arm lift, is a complicated process. Most importantly, candidates should be in good overall health and free of any active diseases or other pre-existing medical conditions which will make them unable to endure the surgery and brachioplasty recovery period. In addition to physical health, candidates should also be healthy mentally and emotionally. The healing process can be difficult and tedious, requiring a great deal of patience and mental stability. There may also be a period of depression which follows the surgery. For these reasons, candidates should be mentally and emotionally healthy when making the decision to undergo an arm lift procedure to ensure that this temporary depression does not worsen a pre-existing mental illness. Individuals who are considering arm lift surgery should also have realistic expectations before committing to undergoing a procedure. The patient should discuss the desired results with the surgeon to ensure the goals can be attained through surgery. The patient and the surgeon should examine brachioplasty photos to be sure they are in agreement regarding the desired appearance after the arm lift surgery. Finally, an individual considering brachioplasty should carefully examine the entire monetary sum of the brachioplasty costs. This is important because medical insurance will not likely cover the costs associated with this type of procedure. Those who are attempting to lose a considerable amount of weight should not have an upper arm lift until they reach their goal weight. Waiting until this time will prevent the need for additional surgeries to remove excess skin after the excess weight is lost. All surgical procedures have some amount of uncertainty and risk. Fortunately, a brachioplasty or upper arm lift procedure is very safe when performed by a certified plastic surgeon. Any questions or concerns you may have will be answered by your doctor during your initial consultation. During the arm lift procedure preparation phase, the surgeon marks the patient with a permanent marker to indicate where the incisions will be made. The location, length and direction of these incision lines will be dictated by the technique being used. During this time, the patient will also be scrubbed with an antimicrobial agent such as betadine to minimize the possibility of infection. The patient is then given injections of lidocaine and epinephrine. The lidocaine is a pain reliever and the epinephrine is a vasoconstrictor, which prevents excessive bleeding during the arm lift surgery. The choice of anesthesia should be discussed between the patient and the surgeon prior to the arm lift surgery date to ensure this decision is given proper consideration. The options include an oral sedative or an intravenous (IV) sedative. Whether you select an oral or an IV sedative, you will likely still be required to have an IV started. Even if it is not used for anesthesia, the IV is used to maintain hydration levels or to administer medications quickly in an emergency situation during the upper arm lift procedure. The treatment area for an upper arm lift is quite small. For this reason, many surgeons and patients may opt for only a local anesthetic in conjunction with a sedative. However, some patients may feel more comfortable having general anesthesia. After administering the anesthetizing agent, either orally or intravenously, the surgeon will test the patient to determine when they are sufficiently anesthetized before beginning the procedure. In most cases, brachioplasty performed alone requires only the use of a local anesthetic. The surgical procedure phase begins after the anesthesia is administered. Monitoring pads are attached prior to beginning the surgery to allow the surgical team to monitor vital statistics during the operation. These monitoring pads are attached to the monitoring equipment via electrodes and used to observe the patient during the surgery. During the arm lift procedure, the surgeon will carefully follow the pre-marked incision lines. The exact actions involved during the surgery will depend on the type of procedures being performed, but most surgeons make the incision on the inside of the arm between the elbow and the armpit. 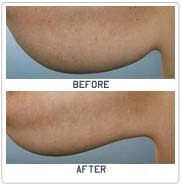 During the procedure, excess skin is removed and the remaining skin is tightened to create a more attractive appearance. After the surgical actions have been taken, but before the incisions are closed, the surgical team will perform a sponge and instrument count. Once all of the materials are accounted for, the incisions are closed by applying tissue glue or by using sutures and staples. A dressing is then applied to protect the wounds, keep the tissue securely in place and reduce swelling. The arm lift procedure's recovery phase follows the surgery. During this phase, the patient is awakened (if they received a general anesthetic) and moved to a recovery room where nurses monitor the patient's vital statistics for approximately two hours. The patient may experience a number of sensations during this time, including, but not limited to, discomfort, emotional anguish, nausea or uncontrollable shivering. The hospital staff can assist the patient during this time by supplying pain relievers, anti-nausea medications, warm blankets and other amenities. You will have dressings covering your upper arms immediately after your brachioplasty. To promote healing, it is essential to leave these bandages on for as long as you are instructed by your plastic surgeon. Gradually, swelling will decrease and you may remove your bandages to debut your newly sculpted and enhanced arms. Patients are typically able to return to work about one week after their upper arm lift. However, it is recommended to wait several weeks before partaking in any strenuous activity. This will help with the healing process and minimize the formation of unsightly scars.With healthy eating and exercise habits, you can permanently benefit from your brachioplasty results. By managing your weight and getting plenty of exercise, you will never have to be self-conscious in tank tops or tighter-fitting clothing again.